I definitely need a new sleeping bag. My +15 down bag did not keep me warm during our final night, which saw temperatures drop to the mid-30s. This has happened on the last few trips; it's time to stop stubbornly holding onto my old sleeping bag and admit that it's not working for me anymore. On the bright side, it's an excuse to shop for new gear. We spent the majority of the night awake, cursing ourselves for not putting our tent up inside the shelter, but not wanting to get up and do anything about the situation. My feet had become blocks of ice, which were very effective at keeping the inside of my sleeping bag cold. At some point very early in the morning, Craig attempted to heat up water so that we could fill my Nalgene bottle with it and use it to heat up my sleeping bag. Our fuel was, of course, too cold to ignite, so he brought the freezing metal cannister into his sleeping bag for a while to warm it up enough to start the stove. 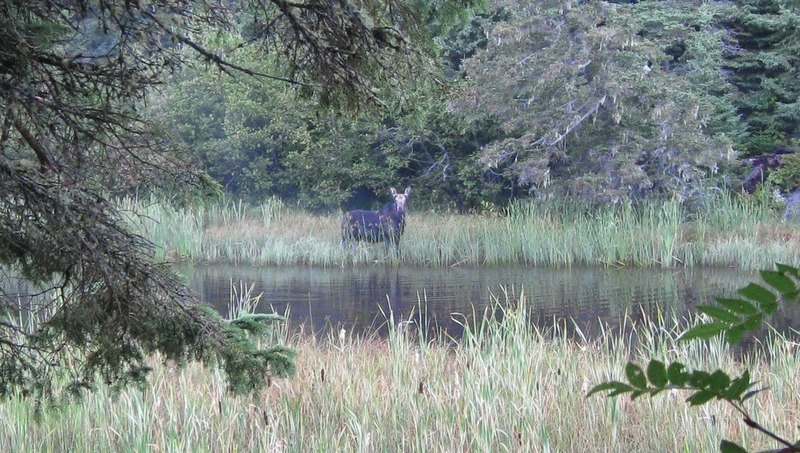 The hot water bottle placed in my sleeping bag's footbox did the trick, and while I slowly warmed up, the moose returned to slosh around in the creek outside our shelter. We got up around 7:00 and watched it wade in the tall grass on the other side of the creek, eating plants. 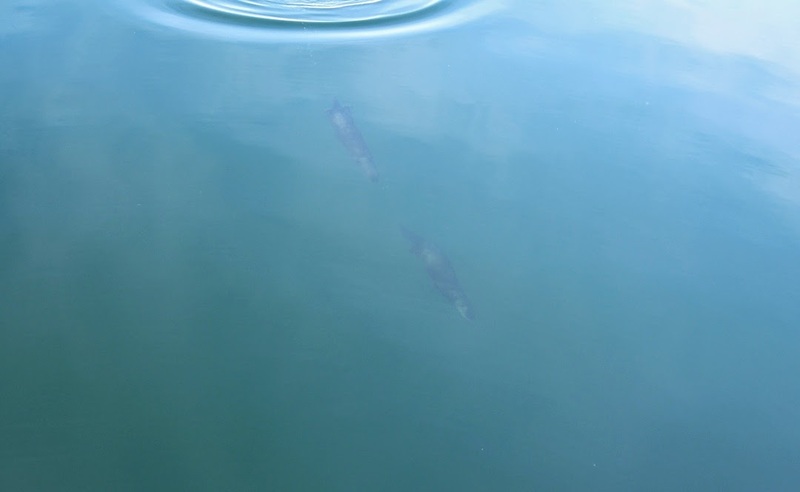 It looked up at us every once in a while, and we tried to figure out if it was a female or a young male. We thought we could make out small nubs on its head – possibly the beginnings of antlers – but we couldn't get a close enough look. We packed up and headed to the Windigo visitor's center, hearing the welcome sound of the sea plane fly in and take off again as we left our shelter. It was sunny but cold, and the thermometer at Windigo read 38º when we arrived at 8:30 a.m. After checking in with Ranger Valerie and reporting our revised hiking itinerary, we learned that we were set to fly out on the sea plane's next pick-up, two hours later. The damaged sailboat that had almost sunk the day before was docked, and it looked bad. Water-damaged items and equipment had been removed from it and were lying on the dock in the sun, while one of the boat's occupants was inside pumping water out. It looked as though a tarp and some extra wood had been nailed in place to cover a hole. We met another guy who had been on the boat and he told us their story. They had sailed from the Apostle Islands in Wisconsin to Ontonagon, MI, then headed north to Isle Royale. Their journey had been fine until they entered Washington Harbor, hit a rock, and started sinking. He was from So-Cal but spoke in a vaguely German accent as he described the incident and how the Park Service came to their rescue. He had also been to Isle Royale before and was fond of the place, but it looked like he and his friends were going to be stranded there for a while under very non-ideal circumstances. We gave him the rest of our food and batteries that we no longer needed and wished him good-luck. We met a couple from Cleveland who were also waiting for the plane and would be flying out with us. They were in their 50s and were big fans of Michigan breweries, and we discussed Michigan beers and other hiking trips with them at length while hanging out in the sun on the dock. Although it was still cold, it was a beautiful sunny morning, and we enjoyed the views of Washington Harbor. 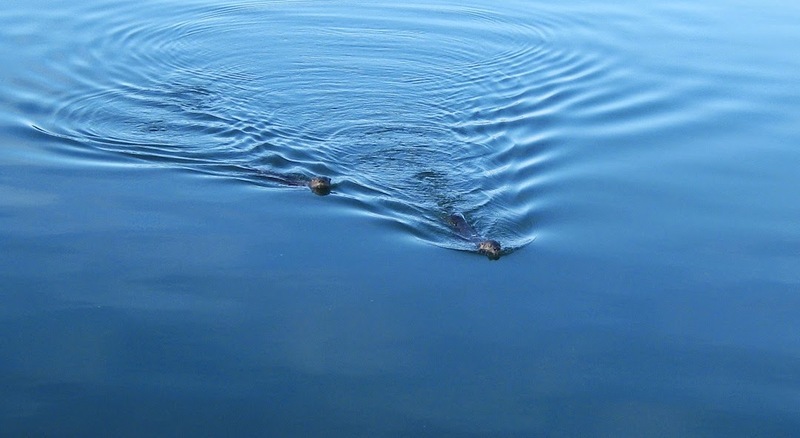 Two river otters swam toward the dock from the direction of Beaver Island, diving underwater just before reaching it and resurfacing on the other side. 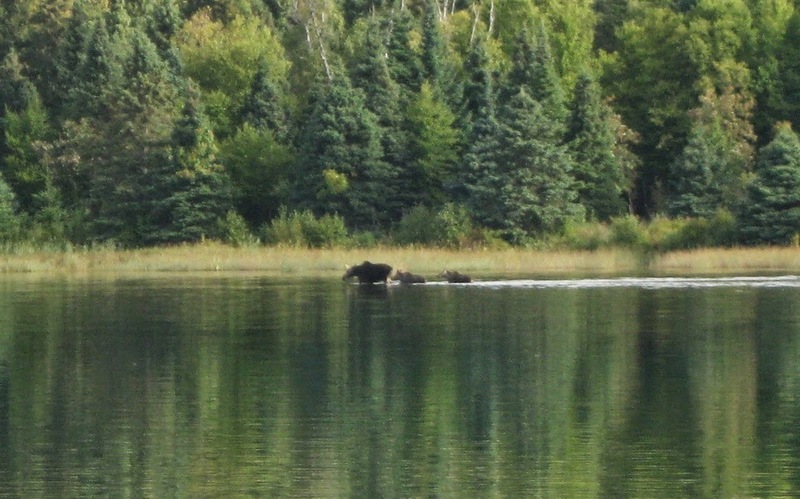 Loud splashing suddenly erupted, and a female moose and two calves appeared in the water at the end of the harbor. They were too far away for me to get a decent picture of them with my small camera, but we all watched them wading in the water while continuing to share stories. The plane arrived at 11:15, and the four of us and our gear were on board in seconds. The pilot was all business, likely wanting to get in and out quickly and onto his next pick-up. The flight back was beautiful. Unlike the overcast flight at the beginning of our trip, the sunlight shone on the blue surface of the lake, and the view was gorgeous. From my seat in the tail of the plane, I turned and watched Isle Royale slowly disappear from view, wanting the sight of its green forested landscape to last as long as possible.